Walgreens Healthcare Clinics in Chicago Area Offer School and Sports Physicals | A Savings WOW! For back-to-school, as part of a sponsored post for Collective Bias® I visited Walgreens Healthcare Clinic to check out the school and sports physicals they offer. With my kids going back to school soon, I needed to get some school physicals done. Since we have not switched to a closer pediatrician and ours is 45 minutes away, I was glad to hear that Walgreens offers an alternative to having to make an appointment with our doctor and driving back and forth that distance. The first thing I did before even heading out to my nearest Walgreens Healthcare Clinic is to go to their website to find out more information about what the clinic offers and to find out what I needed to bring to the school physical. While I was on the site, I saw that the Healthcare Clinic offers many other services. There was even a comparison of what the Walgreens Pharmacy and the Walgreens Healthcare Clinics offer. That’s good to know since the Healthcare Clinics are only in certain locations. During this back-to-school period, the school and sports physicals are only $39 (regulary $60). Once I knew that, I decided to find my nearest Walgreens location with a Healthcare Clinic and schedule an appointment. Unfortunately, there were no appointments available in the locations nearest to me in the next few days. It would have been very helpful to have an appointment, but I decided to check on the wait times available. I was surprised to see that each of the locations near me was showing a wait time of over 2 hours. I tried to call my nearest Healthcare Clinic to find out exactly what paperwork we needed to bring with us because if we were going to have to wait for over 2 hours, I did not want to find out that we were missing anything needed to complete the school physical. I did not get a live person on the phone to answer my questions. I tried again for the next few days at different times to see if the wait times were less, but for the locations near me, they were always over 2 hours when I checked. By the time I was able to get to my nearest Walgreens Healthcare Clinic, it was already closed. However, I took a look around the area and was impressed with it’s look and feel. I went to the kiosk to see if I maybe there were more available appointment times for the following day by using the kiosk. When I got to the screen for scheduling appointments, it did show some open time slots in the next 2-4 days. However, when I went to click on any of them, no appointment times opened up. I guess I will have to try again when there is someone present at the help desk. Overall, my experience trying to get my children’s school physicals done at a Walgreens Healthcare Clinic did not go as smoothly as I had hoped. It seems that the locations near me were just very busy during this time frame. It was difficult to schedule an appointment as timeslots were not available and the walk-in wait times were typically over 2 hours. I wish that it would have been easier to find out the exact paperwork we needed to bring in (like school forms, immunization records, etc.) so that if we had to wait for 2+ hours, it would not be a waste of time if we found out that we were missing something. I was not able to take my children for their school physicals there as a result. I do see the benefit for those who are new to an area and do not have a primary doctor to use the Walgreens Healthcare Clinic for their sports and annual school physicals. It’s also a good alternative for those who have to work late and can’t get to a doctor during their office hours. Have you visited a Walgreens Healthcare Clinic to get your sports and annual school physicals done? How was your experience? 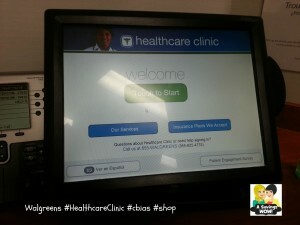 Please check out my Google+ album for more photos of my experience at the Walgreens Healthcare Clinic. It’s such a bummer you weren’t able to find an appointment for your kids to get their physicals! I hope that as the flu season catches up to us that they are able to keep up with the load.